The Creta facelift is launched with some cosmetic changes and upgraded feature list. the facelift version is priced starting from Rs 9.43 Lakhs up to Rs 15.03 Lakhs (ex-showroom). In this article, we have put the 2018 Hyundai Creta Facelift vs competition, which includes Scorpio, Duster and Terrano and compares the prices of all these compact SUVs. 2018 Hyundai Creta Facelift was finally launched after much anticipation. The facelift version gets minor cosmetic changes like some exterior alterations. However, the feature list gets extended and good technology is put in the SUV. Also, the SUV does not receive any mechanical updates. The new feature list includes electric sunroof, 6-way electrically adjustable driver’s seat, cruise control, sliding front armrest, Smart key Band and a wireless phone charger. However, this SUV now comes with a slightly expensive price list. Prices for the base petrol variant start at INR 9.43 lakhs. While the top of the line diesel variant is going to cost INR 15.03 lakhs (ex-showroom). 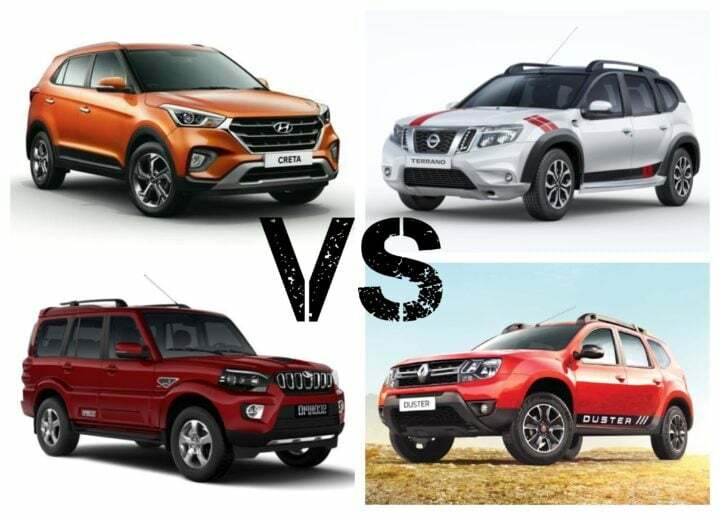 In this article, we put up the facelift Creta against Mahindra Scorpio, Renault Duster and Nissan Terrano in terms of their price list. Creta is available in petrol and diesel variants. The petrol variant starts from Rs 9.43 Lakhs to Rs 13.59 Lakhs. The diesel variant starts from Rs 9.99 Lakhs to Rs 15.03 Lakhs (all prices ex-showroom). The Creta offers AT in both petrol and diesel variants. Scorpio is available only in diesel variant. The diesel variant starts from Rs 10.14 Lakhs and goes up to Rs 16.34 Lakhs (all prices ex-showroom). Duster is also available in petrol and diesel variants. The petrol variant starts from Rs 7.95 Lakhs and goes up to Rs 9.95 Lakhs. The diesel variant starts from Rs 8.95 Lakhs and goes up to Rs 12.79 Lakhs (all prices ex-showroom). Interestingly, Duster offers CVT gearbox in petrol and a normal AMT gearbox in Diesel variant. Terrano is available in petrol and diesel variants. However, only 1 model is offered in petrol. The petrol variant is priced at Rs 9.99 Lakhs. The diesel variant starts from Rs 9.99 Lakhs and goes up to Rs 14.48 Lakhs (all prices ex-showroom). However, Terrano offers AMT only in diesel variant.